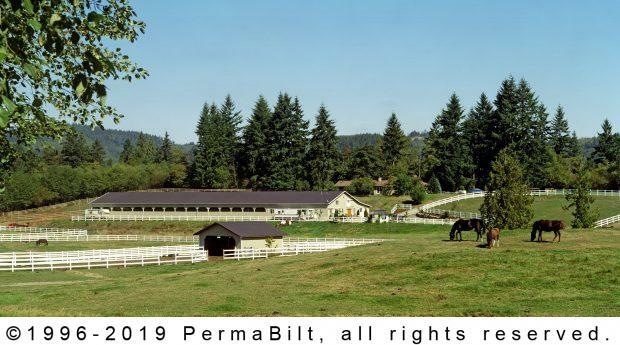 PermaBilt®, since 1973, has built over 20,000 freestanding post frame buildings. And, on occasion, we have built extensions to existing buildings. That was the case with our Snohomish County Washington client who wanted a 24’ x 192’ x 10’ lean- to built onto his existing horse arena. His desire was to add multiple horse stalls and have added space for tack and storage. For an entrance door a 12’ x 9’ slider was chosen. We installed (16) 4’ x4’ double glazed, cross-hatch, vinyl windows with screens and drip caps. For added protection against rain and snow and to keep water away from the base of the building, 2’ overhangs were added along the 240’ of lean-to. When this extension was complete it was as if the extension was built at the time of the arena. The client (and the horses) were delighted with the look and quality of construction and we were proud to have accomplished this challenging process in such a professional manner.